Listed on this page are a few suggestions you might want to try yourself prior to calling out a clock repairman. We have included a picture of a grandfather clock and the name of the parts to help you. If you have any additional questions, please feel free to contact us and we might be able to walk you through your problems and get your grandfather clock up and running. There are many times a grandfather’s clock pendulum will look like it is swinging just fine; however, if the grandfather clock is not running properly the pendulum will eventually stop, usually in 10 to 20 minutes. Here are a few things you might want to try yourself prior to calling a clock repairman. 1. First, make sure your grandfather clock weights have been pulled up. This may sound silly; however, I always ask this question and several times the customer was not aware of this, nor did they know how to do it. It might sound silly to some folks, but if you are not told how, then you won’t know how. Also check to see if the weights are on correctly. Most clocks (not all but most) weights are different in weight. Typically on a modern day grandfather clock, the heavier weight goes on the right side as you are facing the clock. 2. Are the grandfather clock hands touching each other? Touching hands are guaranteed to stop your grandfather clock! Look at the hour and minute hands closely to see if they are touching. 3. Make sure the grandfather clock is level. Some older grandfather clocks will run just fine slightly out of level once the movement has been adjusted. This is not true for the newer grandfather clocks. The newer grandfather clocks need to be level from both front to back and side to side. 4. Are the grandfather clock hands touching the dial glass? If the minute hand on the grandfather clock is touching the front glass, this will stop the clock from working. To repair this problem, slightly bend the hand away from the glass, but be careful not to bend it too much and allow it to touch the hour hand. There is a very fragile part in a grandfather clock that the pendulum hangs on. This part is called a “suspension spring”. I have included a typical picture of one (some grandfather clock suspension springs may vary in size and shape). If this suspension spring gets bent too much or if it breaks, the pendulum will not continue to swing. You may notice when the pendulum swings, it will make a circle or a figure 8 pattern. This is an indication that the suspension needs replacing. Sometimes you may find a part of this suspension spring in the bottom of the grandfather clock’s case. If this is the case, then the suspension spring will need to be replaced and it is recommended that a qualified clock technician performs this job. Grandfather Clock Repair. The picture to the right is a typical newer style Grandfather Clock Movement. It shows how the pendulum and parts are assembled. Many times this assembly will come apart during a move. The video to your right will explain how to adjust the speed of your grandfather clock. It is the same for all pendulum driven clocks. Just remember to adjust the nut in small increments. A quarter of a turn at a time will be plenty. You will eventually be able to get the clock to keep very good time. As always if you continue to have problems you are welcome to contact us for additional information. If your minute hand starts to play the melody either before or after the minute mark or the 1/4 hour marks, there is an easy adjustment you can make yourself. Please click on the video to the right and follow the instructions. If you are still having problems with your grandfather clock, then just give us a call or ﻿email﻿ us and we will try to walk you through the problem. The grandfather clock gets its power from the weights. Some grandfather clocks have 2 weights; however, most newer grandfather clocks have 3 weights. For the purpose of this article, I will be discussing a 3 weight grandfather clock. 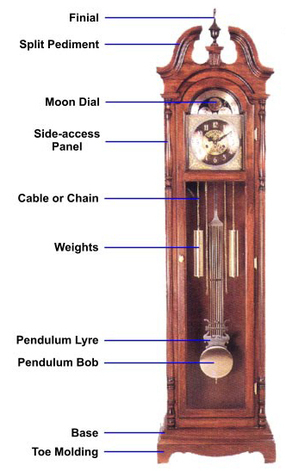 Typically the weight on the right operates the chimes on the grandfather clock and the weight on the left operates the hour strike and the center weight operates the time. On each swing of the pendulum, the pendulum weight drops slightly. When the minute hand reaches the quarter hour, the clock chimes, and the right hand weight drops. 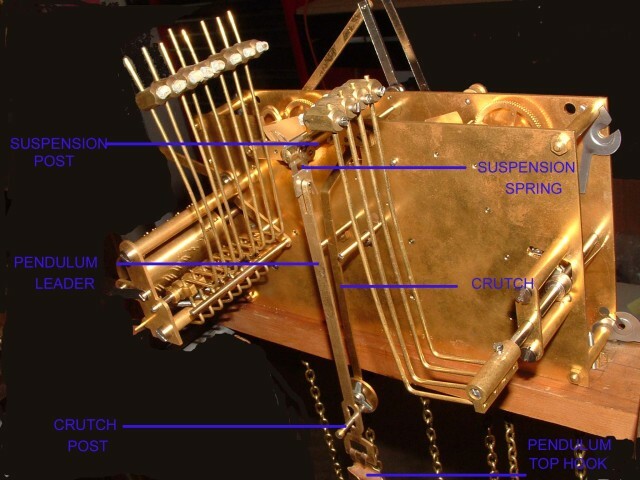 And finally, on the top of the hour, the chimes play, the right hand weight drops slightly, then a lever is tripped, the clock strikes the correct hour, resulting in the left weight dropping. Typically all 3 weights will drop equally (within an inch or so) if the grandfather clock is operating correctly. Some grandfather clock models have a silent or evening switch on them. By turning the silent or evening switch on, the left and right weights will stay stationary during the off periods. In most cases, if there is not an evening or silent switch, or the evening or silent switch is in the on position and the weights still are not dropping, then most likely the clock will need to be serviced. The slightest amount of dirt or the lack of oil is the main cause of this problem and the movement will need to be removed and serviced properly in order to get the clock up and running again. A small trick you might want to try (however, it will not repair the problem permanently), is while slightly pulling down on the right weight with one hand (with gloves on of course) and turning the minute hand with your other hand to either the 1/4 , 1/2 or 3/4 hour, the chimes might start working for a short time. Again this is not a permanent fix; however, it will allow you to see if the clock will start to work again. If the pendulum is swinging correctly then the center weight will drop correctly. Again, for the purpose of this article, I will be discussing a grandfather clock with a Westminster chime. Several newer clocks come with choices of a few tunes; however, the Westminster tune is the most popular. At ¼ past each hour you will hear 4 notes. On the hour (prior to hearing the number of hours chimed), you will typically hear 16 notes. Many times the chiming will get out of sequence due to many reasons. If you have just adjusted the time and the chiming is out of sequence, just allow the clock to catch up to itself. By allowing the clock to run for an hour or 2, the grandfather clock will catch up to itself and the chiming will be back into sequence. 1. Move the minute hand 15 minutes at a time until the grandfather clock chimes the hour. Then stop. Do not be concerned where the minute hand is pointing at this time. 2. Leaving the minute hand in this position, unscrew the nut that holds the hands in place. 3. Remove the minute hand. 4. Re-position the minute hand so that it is pointing to the hour. 5. Reinstall the nut that holds the minute hand in place. The minute hand has a square hole on the base that allows you to position the hand on a square shaft. The minute hand can be installed in one of 4 positions; however, only one position is correct. If your grandfather clock is striking the wrong hour, this is usually a quick fix and will only take a moment to repair. The HOUR HAND ONLY can be moved forwards or backwards without any problem. If the clock is striking the wrong hour, you can simply rotate the HOUR HAND in either direction to the correct hour the clock is chiming. Here is an example. Keep in mind your hour or hand position may be different. EXAMPLE: The grandfather clock is striking 12 times; however, the clock is reading 9 O’clock. 1 After the grandfather clock stops chiming 12, gently grasp the HOUR HAND only and move it either way to the position of 12. Use caution here and make sure you do not move the minute hand or bend either the HOUR HAND or the minute hand. 2 Using your finger nails on your thumb, gently press the HOUR HAND downward slightly. Be careful and do not press so hard that the HOUR HAND touches the face of the clock. 3 The grandfather clock hour strike should now be back is sequence. 1 Wind your grandfather clock every 7 days. 2 Keep the door locked if possible. 3 Wax and polish your clock cabinet as frequently as you do your other furniture. Use a non-silicone liquid or a paste wax. 4 Avoid exposing your grandfather clock to direct sunlight and protect your grandfather clock from extreme temperatures and humidity changes. Prolong exposure to direct sunlight may fade the finish while extreme temperature and humidity changes may cause the wood case to split or crack. 5 Check periodically to ensure that your grandfather clock rests firmly on all four levelers. This is especially important if you plan to keep your grandfather clock on carpet. For the first few months, the grandfather clock’s feet will settle into the carpet and become unbalanced. Adjustment to any of the 4 levelers may be needed. 6 Check the weights (with your gloves on) to ensure that they are still tightly assembled. It is recommended that your clock movement be oiled every two (2) years from the date of purchase and thoroughly cleaned every five (5) to ten (10) years depending on the climatic conditions. Extremely dry, humid or salty air, heat or cold, may necessitate more frequent servicing. If you have tried everything you could do to get your grandfather clock up and running, and it still will not operate properly, then it might be time for a good cleaning and servicing. Give us a call at 678-462-7856 or email us to set up an appointment and we will be happy to come to your home or office and get your grandfather clock up and running.